Bernard had good prospects of success as a secular scholar, but he began to believe that he was called to the monastic life, and after a period of prayer for guidance, he decided at age 22 to enter the monastery of Citeaux (Latin Cistercium, appearing on modern maps as Corcelles-les-Citeaux, 47:10 N 5:05 E), an offshoot of the which had adopted a much stricter rule than theirs, and became the founding house of the Cistercian ( Trappist ) order. (Actually, the Trappists are a reformed (i.e. stricter) offshoot of the Cistercians, who are a stricter offshoot of the Benedictines.) He persuaded four of his brothers, one uncle, and 26 other men to join him. They were the first novices that Citeaux had had for several years. After three years, the abbot ordered Bernard to take twelve monks and found a new house at La Ferte . The first year was one of great hardship. They had no stores and lived chiefly on roots and barley bread . Bernard imposed such severe discipline that his monks became discouraged, but he realized his error and became more lenient. The reputation of the monastery, known as Clairvaux (48:09 N 4:47 E), spread across Europe . Many new monks joined it, and many persons wrote letters or came in person to seek spiritual advice. By the time of his death, 60 new monasteries of the Cistercian order were established under his direction. For four years after 1130 Bernard was deeply involved with a disputed papal election, championing the claims of Innocent II against his rival Anacletus II . He travelled throughout France , Germany , and Italy mustering support for his candidate (and, it should be added, preaching sermons denouncing injustices done to Jews), and returned from one of these journeys with Peter Bernard of Paganelli as a postulant for the monastery. The future Pope Eugenius III spent the next year stoking the monastery fires. Years later, Bernard wrote a major treatise of advice to Eugenius on the spiritual temptations of spiritual power. The papal election was not the only dispute in which Bernard became involved. He was highly critical of Peter Abelard , one of the most brilliant theologians of the day. Bernard believed that Abelard was too rationalistic in his approach, and failed to allow sufficiently for the element of mystery in the faith. When Abelard rejected some of the ways of stating Christian doctrines to which Bernard was accustomed, Bernard concluded, perhaps too hastily, that this was equivalent to rejecting the doctrine itself. A conference was scheduled at Sens (48:12 N 3:18 E), where Abelard's views were to be examined, but soon after it began Abelard decided that he was not about to get a fair hearing, announced that he was appealing to Rome , and left. He set out for Rome and got as far as Cluny , where he stopped. Peter the Venerable , the abbot, was a friend of both Abelard and Bernard, and managed to reconcile them before they died. One of Bernard's most influential acts, for better or worse, was his preaching of the Second Crusade . The First Crusade had given the Christian forces control of a few areas in Palestine , including the city of Edessa (now Urfa ). When Moslem forces captured Edessa in 1144, King Louis VII of France (not to be confused with St. Louis IX , also a Crusader, but more than a century later) was eager to launch a crusade to retake Edessa and prevent a Moslem recapture of Jerusalem (31:47 N 35:13 E). He asked Bernard for help, and Bernard refused. He then asked the Pope to order Bernard to preach a Crusade. 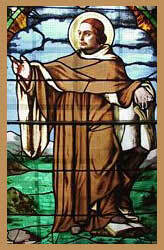 The pope gave the order, and Bernard preached, with spectacular results. Whole villages were emptied of able-bodied males as Bernard preached and his listeners vowed on the spot to head for Palestine and defend the Sacred Shrines with their lives. The preaching of the Crusade had an ugly side-effect. In the Rhineland , a monk named Raoul wandered about telling crowds that if they were going to fight for the faith, the logical first step was to kill the Jews who were near at hand. There were anti-Jewish riots in Mainz (50:00 N 8:16 E, in the Rhineland), where the archbishop sheltered the Jews, or many of them, in his palace, and sent an urgent message to Bernard to come before both he and they were killed. Bernard came. He called Raoul arrogant and without authority, a preacher of mad and heretical doctrines, a liar and a murderer. Then he he got nasty. Raoul sneaked off the scene, and the riots were over. From that day to this, Bernard has been remembered among Rhineland Jews and their descendants as an outstanding example of a "righteous Gentile," and many of them (e.g. Bernard Baruch ) bear his name. If Bernard in controversy was fierce and not always fair, it partly because he was a man of intense feeling and dedication, quick to respond to any real or supposed threat to what he held sacred. It is his devotional writings, not his polemical ones, that are still read today. Among the hymns attributed to him are the Latin originals of "O Sacred Head, sore wounded," "Jesus, the very thought of Thee," "O Jesus, joy of loving hearts," "Wide open are Thy hands (to pay with more than gold the awful debt of guilt and sin, forever and of old--see the Lutheran Book of Worship et alibi)," and "O Jesus, King most wonderful." [for these hymns, see the Cyberhymnal ]. His sermons on the Song of Songs , treated as an allegory of the love of Christ, are his best-known long work.